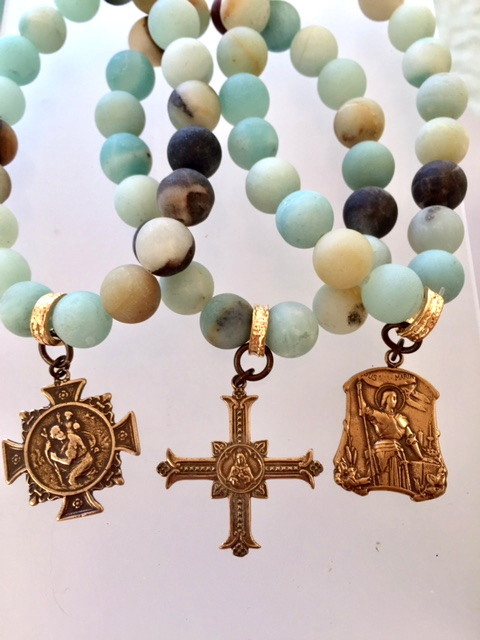 We are pleased to offer this genuine Amazonite Stone bracelet with a CHOICE of religious charms. From left to right; Saint Christopher, a gothic Cross with the Sacred Heart and lastly Saint Joan of Arc. Bracelet is elastic, ons size fits most. Please specify charm when ordering, if no selection is made we will send the Gothic Cross. The amazonite stone is said to be of truth, honor, communication, integrity, hope and trust. It is known to have healing powers, to help with physical ailments, emotional issues and is associated with filtering out stress.